One hour, two hours or six hours? How long does a weed high really last? As you’re about to find out, there are a lot of factors that influence the length of your high. It's not just about how much you smoked. It might come down to what you ate for lunch, or how much of a tolerance you have built up. It can also depend on how you consumed the cannabis. After all, any experienced cannabis enthusiast will tell you, smoking is very different from eating an edible. The altered state of reality experienced after smoking or eating marijuana is thanks to tetrahydrocannabinol (THC). This cannabinoid is not alone. In fact, there are another 60 to 80 known cannabinoids in the cannabis plant. THC is the only one that makes you feel "stoned". This is because the THC molecule interacts directly with our endocannabinoid system. Never heard of this system? Yet this system controls many physiological processes, including our appetite, pain modulation, memory and inflammatory response just to name a few. Because the THC molecule binds to a receptor in our brain called the CB1 receptor, it triggers feelings of euphoria and relaxation. But for some people, it can cause anxiety. Being high is different for everyone. But some common experiences include feeling giggly, confused, an increased appetite and even sometimes paranoia. The high will last as long as the molecules are latching on the receptor. As they release, these feelings will subside. There are different ways to ingest the THC from cannabis. Each one has slightly different effects on the experience and the duration. These differences are because the THC enters the bloodstream through different mechanisms. For instance, either through the respiratory system or the digestive tract. Eating often takes longer to kick in, but the high is more intense. On the other hand, smoking or vaping is a quick come on, but rapid deceleration. But let's break it down even more, how much does the high differ between each type of ingestion? 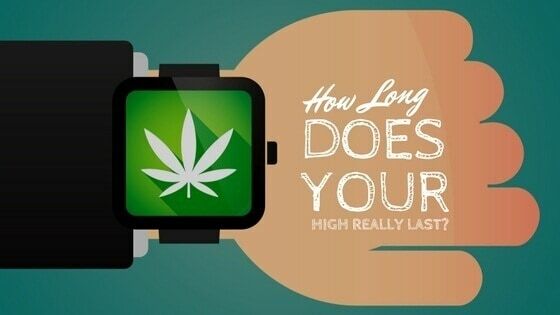 How Long Does a High Last After Smoking? Smoking, arguably the most common form of ingestion, also is the quickest to take effect. When you inhale cannabis smoke, you take the cannabinoid molecules, like THC, into your lungs and almost immediately into your bloodstream. The effects will come on rapidly, within a few minutes. Despite the rapid onset, there is also a relatively short period where you will feel stoned. On average, people feel high for between two to four hours after smoking. You might feel a little fuzzy for longer, but the peak experience will gently subside after only a few hours. How Long Does a High Last After Vaping? Smoking physically burns the organic plant material. There is some debate about how much THC is absorbed when its inhaled alongside burnt matter. Vaping exposes the cannabis to lower temperatures, without burning. Plant material has water that evaporates, taking cannabinoids like THC with it. When vaped, you get as much as 95 percent cannabinoids due to the lower temperature. A vaped high should last roughly the same length of time as smoking. The experience, however might be slightly more powerful. If you are curious about the main differences between smoking cannabis and vaping it, including pros and cons, Mandee Lee with Green Flower has an excellent short video exploring the differences. She also gives some personal history with her experience smoking and her transition to vaping cannabis. It's a great place to start for more information on the different experiences between the two ingestion methods. How Long Does a High Last After Eating an Edible? Eating an edible is a much different than smoking or vaping. If you decide to ingest cannabis via an edible format, it takes much longer to take effect. It's because the cannabinoids need to be digested through the gastrointestinal system. Once digested, it turns into a less-known metabolite called THC-COOH. Unlike other forms of THC (THCA for example), THC-COOH is particularly adept at entering into the circulatory system. This makes for a very powerful experience. Because of this reliance on the digestive tract, it can take a full one to two hours to take effect. And can last for upwards of six to eight hours! Is There a Way to Sober Up Quickly? If you’ve smoked too much or overeaten, knowing how to sober up quickly can be helpful. If you’ve got to go to work or need to interact with a large group of people, being too high makes it remarkably difficult. Unfortunately, there is no magic pill or easy method of sobering up. The only tried and true method of getting physically sober is to let the cannabinoids run their course in your body. But, even if you can physically sober up quickly, there are a few ways which might help you get mentally sober. Change of setting, for example, if you are inside, go outside. If all else fails, you might have to wait it out. But no matter how strong the experience, keep in mind that it will soon pass, and the intensity will subside in only a few hours. What About Making the Effects Last Longer? Just like there are ways to decrease the effects of cannabis, there are also ways to make the experience more powerful. And no, it isn't just smoking more cannabis. Have you ever heard of the mango theory? Essentially, there is anecdotal evidence to suggest that the nutrients and enzymes in mangos may actually pump up the psychoactive compounds in marijuana, making you higher. Another way is to move away from inhaling THC, and instead eat your way through the edibles at your local dispensary. As mentioned, the high from edibles typically lasts for twice as long as smoking. Depending on potency and strain, edibles may last for eight hours or more. What Can Affect the Length of the High? If we both smoked the same size joint, and the same strain, we would likely feel the high much differently. While one person might feel the effects powerfully for a shorter period, another person might not feel anything. Because everyone’s physiology is totally different. In much the same way that what we eat affects our weight differently, what we smoke can have similar variability. There is an interesting, but poorly understood relationship between human metabolism and marijuana. Especially when eaten, THC is processed through the liver, which means it is metabolized. Most of us are aware that metabolism is a very individual process. Depending on how fast, slow, or functional your metabolism is, it can seriously affect body weight. It can also affect how quickly (or slowly) your liver processes the medicinal cannabinoids in THC. In essence, if you have a slow metabolism, you’re very likely to have a slow come on, and a slow come down after eating an edible. It just takes your body longer to process. All cannabinoids are eventually metabolized by the liver. Your liver is also responsible for metabolizing most common pharmaceuticals, in the hepatic drug category. Certain hepatic drugs may interfere with the liver’s ability to process cannabinoids. Vice versa, cannabinoids like CBD can interfere with metabolizing of pharmaceuticals. Therefore, depending on what prescriptions you are taking, it may increase or decrease the length of your high, dependant on how quickly the liver can process the cannabinoids. Tolerance is another strange concept currently under investigation in scientific study. If you’ve never smoked before, a single joint can quickly put you on the couch, and yet some people smoke every day, continuing to function normally. Tolerance to THC developed rather quickly, thanks to the ingenious way our body adapts to an introduction of excess cannabinoids. At first, your brain will have all receptors firing, with a multitude of CB1 receptors open and ready to bind with THC. As your body adapts to the excess of cannabinoids, it will reduce the number of available receptors, and tolerance develops. It is indeed an ingenious method of adaptation. We’ve covered how long a cannabis high lasts if you smoke (two to four hours), if you vape (two to four hours), and if you eat cannabis (six to eight hours), but how long does it linger in your system? For anyone who has ever faced a drug test, knowing how long the THC lingers in your system is crucial to passing. 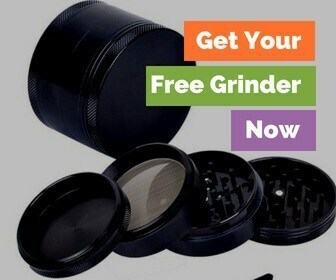 The first step to finding out how long cannabis lingers is to find out what the drug test is looking for. There are two different molecules a drug test could test for, the first is THC and the second is THC-COOH. One of the most common tests is an oral swab or saliva test. It tests for the THC molecule, which is usually only detectable immediately after consumption. Only 12 hours after smoking, you should be able to pass an oral swab drug test. If you are a heavy smoker, you may want to give yourself at least one day. Blood and hair tests are expensive and difficult to conduct, so most people will only encounter a urine test. All these tests don't look for THC, but instead THC-COOH. If you remember, THC transforms into THC-COOH once metabolized by the liver. This THC-COOH metabolite is unfortunately stored in fat cells, and can, therefore, linger much longer - upwards of a month or more. The more you smoke, the more THC-COOH build up is likely to occur, and the longer the compounds will linger. Some reports indicate that users might have THC-COOH up to 40 days after their last use. Be sure to give yourself adequate time between smoking and your drug test to allow for all lingering molecules to dissipate. So, how long does a weed high last? If you have some where important to be, I wouldn't press these times any further! These are just the peak times. You can still feel hazy or fog headed for quite some time after! What about you? How long does your high usually last? We'd love to hear about it in the comments section below.